At the site of the Necropsy Rite in the Cancerverse, Thanos kneels at the feet of Lord Mar-Vell and proclaims his desire to die! In response, Mar-Vell gladly instructs his Cancerverse creatures to capture the avatar of death and presents him to the Many-Angled Ones! Mar-Vell's multi-tentacled masters grant him a ceremonial device (in the form of what appears to be the Cancerverse's Infinity Gauntlet) which changes shape into a black sword. The former hero then plunges the sword deep into Thanos's chest! Back in our universe, the cosmic heroes and the abstracts continue their battle against the invading forces of the Cancerverse. Karnak of the Inhumans suggests the Shi'Ar and Kree fleets continue assisting Galactus while Blastaar's army attacks from behind. Queen Medusa informs them that Blastaar has fled from the war but the Spartoi and Xarthians will take up the rear position. She has also instructed the Nova Corps to support Galactus. The Corps, led by Wendell Vaughn, responds by launching their attack on the Galactus Engine. Meanwhile, inside of Knowhere, Namorita and Major Victory coordinate with the WorldMind in their attempts to make contact with Nova. Rich's girlfriend and the WorldMind are concerned that they have not been able to establish communications with him for almost twenty minutes. Suddenly, Major Victory reads an enormous energy spike from the Cancerverse! Back in the other universe, Lord Mar-Vell continues his efforts to kill Thanos. Elsewhere, the Guardians of the Galaxy are being held captive by the Many-Angled Ones. Mantis has a premonition of Nova coming to their rescue. A second later, Richard Rider comes bursting into the Cancerverse and begins blasting the creatures! The Revengers respond by attacking Nova in full force. To gain an edge in the battle, Rich demands that the WorldMind channel the entire Nova Force to him. The artificial sentience tries to explain that would require stripping all of the other Nova Corps members of their powers. Nova understands and orders the transfer. Given the increased power, Nova Prime knocks the Revenger versions of Thor, Ms. Marvel and Quasar unconscious in one powerful blast! Meanwhile, Thanos reveals to his attacker the common failing shared by both Lord Mar-Vell and the Captain Mar-Vell of his universe. The two Krees were both headstrong without considering the consequences of their actions. Thanos explains that he has been brought to his death...literally. Suddenly, the abstract being known as Death appears and touches Lord Mar-Vell. With the arrival of Death in the undying Cancerverse, a sudden and powerful chain reaction begins and results in the death of everyone in its path! Back at the Fault in our universe, the energy explosion created by Death destroys the Galactus Engine and the invaders from the Cancerverse. In a enormous burst of light, the Fault collapses and is sealed! At the Necropsy Rite area, Thanos attempts to talk to Death. He explains that he should have known she had a plan for him when she made him unkillable. The mad Titan asks his former love to end his existence so he can be at her side forever. Death turns away without a word. Thanos angrily demands to know what he needs to do for her. He offers to kill any number of universes she wants. Her only reply is a single tear running down her cheek. The Guardians of the Galaxy decide to get out of the Cancerverse before it completely collapses. Everyone teleports back to Knowhere with the exception of Star-Lord and Nova. Peter explains that they need to engage Thanos in battle long enough for the universe to finish dying and taking their enemy with it. Otherwise Thanos will simply teleport back to our universe and continue to be a threat. Back at Knowhere, Major Victory explains to Rocket Raccoon that he can't transport anyone to or from the Cancerverse since the teleportation cortex has been shut down by the Fault's shockwave. Meanwhile, Rich asks Peter how long they need to occupy Thanos. His friend believes the Cancerverse has about sixty seconds of life left in it. To help in their fight, Peter Quill pulls out the damaged Cosmic Cube he has kept in his jacket. Peter thinks the cube is capable of one, maybe two, blasts before it fails. The two heroes race towards a raging Thanos. Rich reminds Peter that he once said "if death ever comes your way and won't let you pass, make sure you scream right back in his face". Peter Quill responds that Rich shouldn't trust anything he says since he makes stuff up most of time. Richard Rider admits that he knows he makes things up but thinks they should scream in Thanos's face anyway. 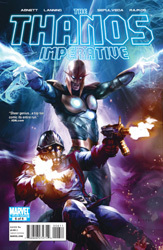 The two heroes unleash the combined power of the Cosmic Cube and the Nova Force in a blinding burst of light. Three days later in the city of Attilan on the Kree homeworld of Hala, the surviving heroes of the war gather together to remember their fallen comrades. Following Medusa's eulogy, Quasar and Rocket Raccoon walk through a cemetary amongst the statues created for the deceased. Wendell mentions that Namorita and Rich's brother, Robert Rider, are taking Rich's death hard. He also reveals that the WorldMind has gone into a reboot shutdown with the loss of the Nova Force. The two stop at the statue of Peter Quill and Richard Rider and pay their respects.